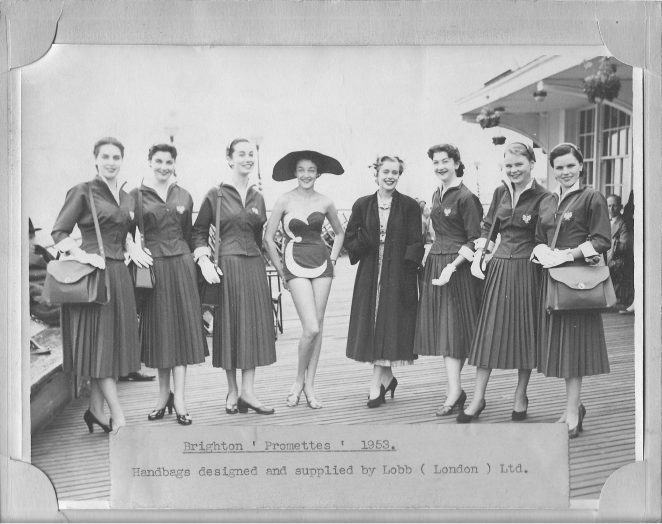 Whilst looking through some family archives I came across this wonderful photo of the Brighton Promettes in 1953. My family had shops selling luggage, briefcases, leather goods, handbags and jewellery in North Street, East Street and Western Road (before Churchill Square was even thought about). Do you recognise yourself or anyone else here. Or do you remember seeing the Brighton Promettes? If you can help, please leave a comment below. Interesting – Lobb were (and are) posh shoe-makers in the West End of London. Didn’t know they made anything else, especially back in the 50s when they were still mainly patronised by the aristocracy and ruling elite. Of course members of the Rolling Stones have been known to purchase the odd pair of brogues there since then! I remember the promettes very well. One of them was a girl named Pauline (not in the picture). She and I were both members of the St. Nicholas Church youth club. Stefan, unfortunately no relation. We used to pass their shop in St James, London, frequently.